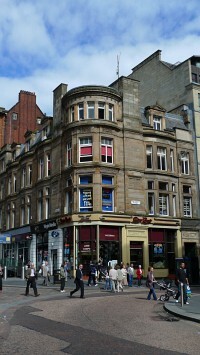 In 1901, John Honeyman & Keppie made minor, unspecified alterations to this city-centre building, designed by James Sellars. 1 Consultation had taken place eight years earlier but no work was carried out at that time. Further alterations were proposed in 1901. However, no payments were recorded, which suggests that these were abandoned. 1: Elizabeth Williamson, Anne Riches and Malcolm Higgs, Buildings of Scotland: Glasgow, London: Penguin, 1990, p. 223.